The GCU/Habitat for Humanity partnership has already renovated 100 homes — and 600 more are on the way. 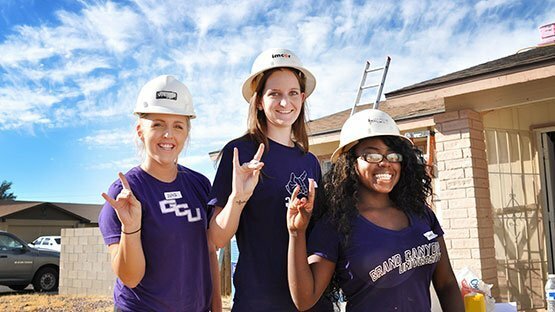 Appropriately timed with the next Serve the City project on Saturday, Grand Canyon University and Habitat for Humanity Central Arizona have reached a monumental goal: the renovation of more than 100 homes in the University’s west Phoenix neighborhood. With paintbrushes, shovels and rollers in hand, GCU staff and student volunteers will descend on 11 homes within walking distance of the university as part of the Canyon Corridor Project, the largest neighborhood revitalization project of its kind in the nation. “Working alongside our neighbors, we have the ability to lift up one of the oldest areas in Phoenix,” said Brian Mueller, president of GCU. The University and Habitat for Humanity kicked off the first of the four-phased project in 2015, helping local homeowners make repairs to their residences that they would not have the wherewithal to complete on their own. Habitat for Humanity provides the leadership, tools and equipment, while GCU supplies the volunteer manpower along with $700,000 in subsidies to help cover the costs of the repairs. All told, the partnership is targeting 700 homes in the area for repairs, which range from painting and landscaping to new windows and roofs. Significant support for K-12 education: The University’s free tutoring/mentoring program has expanded to 25 Phoenix-area high schools, is served by 1,200 GCU students, and in partnership with Valley businesses provides 100 full-tuition college scholarships each year for students from inner-city schools. Safety: GCU is in Year 4 of a $1 million partnership with Phoenix Police to improve safety in the communities surrounding GCU. Crime has dropped 30 percent in the two-mile radius surrounding the University. Job creation on GCU’s campus: The number of full-time employees has tripled from 1,219 in 2008 to nearly 4,000. Job creation off campus: GCU is launching 10 new business enterprises that will provide management opportunities for its recent graduates and employment opportunities for current students and neighborhood residents, while spurring economic growth in the area. While there is more to do, the initial outcomes are promising, Mueller said. “Home values are rising, crime rates are falling and the streets around GCU are becoming friendlier,” he said. About Habitat for Humanity Central Arizona: Habitat for Humanity Central Arizona (Habitat) is a local affiliate of Habitat for Humanity International, the renowned humanitarian organization based in Atlanta. Each affiliate operates as a separate 501c3 non-profit organization and is responsible for leading its fundraising and operations management, while adhering to the Habitat for Humanity mission of serving communities within its area. Habitat also promotes volunteer programs with corporations, groups, churches and individuals. Services include new home construction, re-constructions, renovations, repairs (even emergency repairs) and most recently, entire neighborhood revitalization projects. Consistently ranked among the Top 10 of 1,400 affiliates nationally, Habitat has built more than 1,100 homes in the metro Phoenix area. To learn more, visit habitatcaz.org.